Indian Sarus Crane: Plains of north, northwest, and west India, western half of Nepal’s Terai Lowlands, small numbers in Pakistan. Eastern Sarus Crane: Originally occurred throughout Indochina; in the last 50 years, it has been decimated throughout this range, but occurs in smaller numbers in Myanmar, Vietnam, and Cambodia. In Yunnan Province (China) or Lao P.D.R. are either rare or recently extirpated; Thailand was thought extirpated in the mid-20th century. Australian Sarus Crane: northeast Australia. Mostly non-migratory in India; may make short seasonal movements between dry and wet season habitats in Southeast Asia and Australia. Indian Sarus Cranes have adapted to dense human population in India, and interact closely with people in areas where traditions of tolerance prevail. Similar adaptations occur with Eastern Sarus in some regions of Myanmar. Throughout their range Sarus Cranes utilize a wide variety of landscapes, depending on food availability, cropping patterns, and other seasonal factors. Optimal habitat includes a combination of small seasonal marshes, floodplains, high altitude wetlands, human-altered ponds, fallow and cultivated lands, and rice paddies. Breeding pairs place their nests in a wide variety of natural wetlands and along canals and irrigation ditches, beside village ponds, and in rice paddies. Compared to other crane species, Sarus Cranes will utilize open forests where wetlands occur as well as in open grasslands more so than other crane species. Where possible, the nests are located in shallow water where short emergent vegetation is dominant. For nesting, use of human-dominated wetlands is most common in India, less common in Myanmar and Australia, and is rare in Southeast Asia. 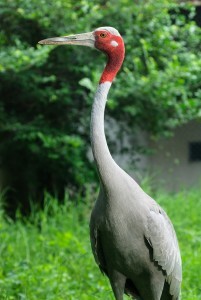 6 feet tall (tallest crane species), wingspan of 8 feet. More than 20 years; up to 80 years in captivity. All cranes are omnivorous. Sarus Cranes feed on aquatic plants such as tubers of native sedges (esp. Eleocharis), invertebrates, grains, small vertebrates, and insects. Body plumage is light gray. Crown is covered with smooth greenish skin. Rest of the head, throat, and upper neck are covered with rough orange/red skin. Ears are marked by a small area of grayish white feathers on each side of the face. Long, black hair-like bristles cover parts of the upper throat and neck. In the Indian Sarus, white feathers form a collar in between the bare reddish skin of the upper neck and the gray feathers of the lower neck. Legs and toes are a shade of red. Males and females are virtually indistinguishable but within pairs, females are usually smaller than males. The heads of juveniles are covered with cinnamon brown feathers, and the grayish ear patch is not yet obvious. Body plumage changes from cinnamon brown to gray as the bird matures. Mated pairs of cranes, including Sarus Cranes, engage in unison calling, which is a complex and extended series of calls where male and female vocalizations differ but are coordinated. The birds stand in a specific posture, usually with their heads thrown back and beaks skyward during the display. The female initiates the display and utters two calls for each male call. The male always lifts up his wings over his back during the unison call while the female keeps her wings folded at her sides. All cranes engage in dancing, which includes behaviors such as bowing, jumping, running, stick or grass tossing, and wing flapping. Dancing can occur at any age and is commonly associated with courtship, however, it is generally believed to be a normal part of motor development for cranes and can serve to thwart aggression, relieve tension, and strengthen the pair bond. Cranes will keep the same mate from year to year unless one dies or the partnership is unsuccessful, where they will seek out new mates. Nests of all Sarus Cranes consist of wetland vegetation. Unlike some cranes, Indian Sarus Cranes breed throughout the year, except in May and June. Eastern and Australian Sarus Cranes now breed primarily in the rainy season though Eastern Sarus were reported to breed in floodplain wetlands during the dry season before their range dramatically receded. Females usually lay 2 eggs; incubation (by both sexes) lasts 31 to 34 days. The male takes the primary role in defending the nest against possible danger. Chicks fledge (first flight) at 85 to 100 days. Wetland loss and degradation are critical problems throughout the range of Sarus Cranes. Heavy chick loss because of the wildlife trade is currently limiting population numbers of the Eastern Sarus Crane. Destruction of wetlands due to agricultural expansion, however, is increasing dramatically and poses a significant threat as well. These threats reflect increasing human population pressures. The future of the Indian Sarus Crane is closely tied to the quality of small wetlands in India that experience heavy human use, such as; high rates of sewage inflow, extensive agricultural runoff, high levels of pesticide residues, and intensification of agricultural systems. Cranes have died due to pesticide poisoning in India. For more information on conservation programs, visit the International Crane Foundation website. Throughout China and other parts of Asia, cranes symbolize longevity and marital fidelity.